Here's the latest list of Police Employees and Public Servants sacked, or charged or convicted of an offence 2009 to 2019. Version 36. PLEASE - only share this original version. DO NOT edit or change this document in any way. I do not consent to any public use of my work, unless in this original state and with my consent. Here's the latest list of Police Employees and Public Servants sacked, or charged or convicted of an offence 2009 to 2098. Version 35. Here's the latest list of Police Employees and Public Servants sacked, or charged or convicted of an offence 2009 to 2018. Version 34. Here's the latest list of Police Employees and Public Servants sacked, or charged or convicted of an offence 2009 to 2017. Version 33. I am so sorry to hear of the passing of Sammy Lee. Sammy was my local Councillor from the year 2000, until Knowsley Council decided to get rid of the Longview ward. Sammy was an old school Councillor, the best kind, and one of the only Councillors who would actually have a reasonable and sensible discussion with me, rather than the ones now, who just stare at you and have a pre-conceived (wrong) opinion. Here he is talking to me in 2013, calling me nuts and crackers. Sammy called me many names, but our discussions were never heated or aggressive because there was a mutual respect. Sammy knew what I was about, and knew many of my views. Many views that we agreed on, some that we never, but he'd always take the time to chat, every time we crossed paths. I wish our local Councillors nowadays were like Sammy, sadly they are not. I never see my local Councillors anymore, when I do it's always a hostile environment. The last time I spoke to Sammy was caught on video strangely enough, by the Knowsley Council leader Andy Moorehead. Sammy was in very poor health at the time, but still took the time to have a chat with me. Andy Moorehead says he filmed us because he was worried about Sammy's safety when talking to me, a resident he had known for 20 years or so. I think that says more about Moorehead, than me. Sammy will be sorely missed. I'll miss our chats and discussions. Deepest sympathy to all Sammy's family and friends. Knowsley Council Leader Andy Moorehead seems to think it's perfectly okay to film local residents from behind his office curtains, when he really should have been working on Council business. You know, the usual destruction of 51% of Knowsley's greenbelt, and figuring out how to save all of their skins from bankruptcy. 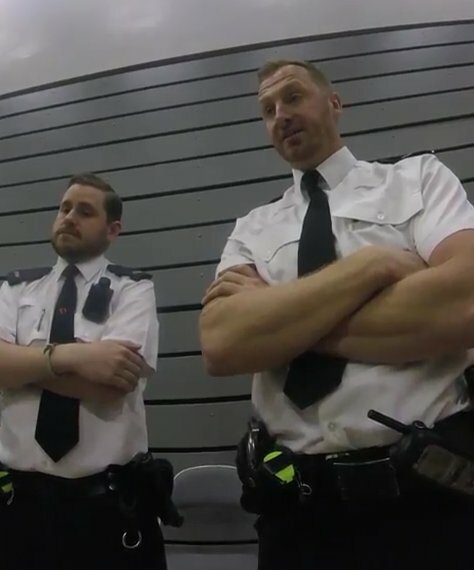 But when he is filmed at a local election count standing by Knowsley MP George Howarth, he gets Police to back him up, and they do. Even though they haven't got a leg to stand on, and no law to support their oppressive view, they try their best to bully, provoke and intimidate. But they end up looking rather silly. 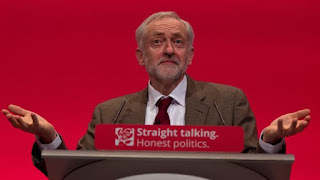 "If she cannot get her Queen’s Speech through Parliament at the first attempt – constitutional law makes Jeremy Corbyn the Prime Minister by default, without the need for him to do the same." Here's the latest list of Police Employees and Public Servants sacked, or charged or convicted of an offence 2009 to 2017. Version 32. Here's the latest list of Police Employees and Public Servants sacked, or charged or convicted of an offence 2009 to 2016. Version 31. The Knowsley Council meeting on 14th Dec 2016. Knowsley Council don't have any Social Housing, it's owned by KHT. Cllr O'Keefe moves a 'Healthy weight declaration', and Council leader Andy Moorehead seconds the motion with a politically incorrect comment that he "puts his full weight behind it." Cllr Smith against the additional position to assign a Cabinet Member Special Responsibility Allowance (i.e. 1.5 x Basic Allowance) pro rata until the end of the current municipal year. Council leader Andy Moorehead says Cllr Smith is being incongruous and the Knowsley Lib Dem party is crass. Cllr Murphy accuses Cllr Cashman of not "understanding City Regions"
Cllr Cashman ask the leader for an update on the Prescot fire in Carr Lane, but he gets heckled by Labour Councillors when he tries to ask a supplementary question. The arrogance of Cllr Morgan, when he states that "over the next four years, this Council will deliver more than 700 new homes......", "am I going slow enough for you (Cllr Cashman)?" First off, the Council are NOT building any homes, ALL these new homes are being built by PRIVATE companies. The Lib Dems are against building homes on the greenbelt, and yet the Labour response to this is to try and make the issue about 'vulnerable children'. A bit of emotional blackmail I'd say. "The building of houses on the greenbelt will bring in a million pounds a year on Council tax, of which we will spend on vulnerable children"
Cllr McGlashan seems to be a professional heckler, and it seems the majority of Labour Councillors will use every opportunity to have a go at Cllr Cashman and Knowsley Lib Dems. The DISRUPTIVE behaviour of Labour Councillors, who heckle and intimidate Lib Dem Councillors is astonishing, when you consider that residents have been BANNED from attending meetings for much less. Full length video of the "Rock n Roll"' night at the Longy Labour Club back on 25th April 1990. With thanks to Richard Raisbeck for the video. Full length video of the "Fancy Dress" Night back on the 16th Sept 1989. Full length video of the "Roaring Twenties" Night back on the 29th Oct 1988. Full length video of the "Glenn Miller"' night at the Longy Labour Club back on 19th June 1988. On Mon 5th Sept, a group of local residents protested at the Knowsley Council meeting over plans to dispose of a number of green space sites in Knowsley for development, in addition to the 51% disposal of Knowsley's greenbelt. The residents were also protesting over the permanent ban of six Knowsley Residents, who were banned for expressing their views over the greenbelt destruction at the Council meeting in Jan 2016. At the Knowsley Flower show, watching the awards with a few friends, one who had a banner out that stated how Knowsley Council blacklists local residents for standing up for their beliefs, when we were approached by a Police Officer, who was quite nice at first. But then got a bit unfriendly when I opened my mouth. "On the 28th of July 2016 at around 1pm, PC Phillip Towers 8008 of St Anne Street Police Station Disruption Team, suddenly attacks a 7 stone disabled man outside Liverpool Crown Court. This video is filmed seconds after the man was shoved in the chest, then violently grabbed and pushed to the floor, landing on his back and head. The officer then jumped on the man 'Towering over him' on all fours. The Officer 'PC Towers' was appearing in court at the time, and had been returning to court with two fellow officers; also witnesses in the case. They were returning from the shops after being told not to confer. The case was as an Appeal at the Crown Court and the disabled mans friend was the Defendant in the case. She was appealing her conviction of a Public Order section 5 offence and for assaulting PC Towers and another officer from the disruption team. 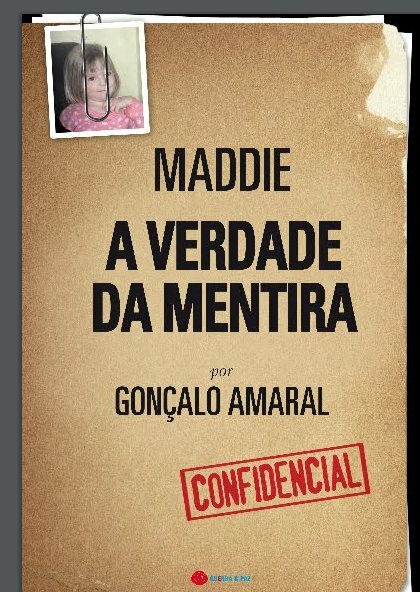 She maintains she is innocent and he assaulted her and has the evidence and witnesses, but was still found guilty again the following day. The disabled man was arrested for a PO section 5 despite only talking to the officer a respectful distance away when the officer suddenly and wildly attacked!! Is this Liverpool's most violent copper? Did you witness this incident? Do you know of any other similar incidents? If so please contact Justicewatch.co.uk or visit at Justice Watch on Facebook"
Since 2014, I've filmed Council meetings and interactions with the Council, despite their protestations that I needed their "consent to film". This paid off when in 2015, the Council relented and officially permitted the filming of Council meetings, and they also recognised the right to film in Public places, of which Council buildings are. This is what happened when we point out that the sign has no validity in law. Unite the Union Workplace Organiser and Liverpool Against the Cuts activist Michelle Smith, was today jailed for twelve months for throwing bricks at opposing protesters at a march in Dover this year. Smith, who is a North West regional organiser for UNITE the union, and describes herself as an 'Anti- Fascist" was sentenced at Canterbury Crown Court. Smith also seems to be the contact for UNITE's General Secretary Len McCluskey according to this post made on Facebook. The Mum-of-two had travelled from her home in Liverpool to join a left-wing march against racism in the town.But the £37,000-a-year official with Unite The Union was caught on camera throwing rocks at far-right demonstrators. Judge Adele Williams watched a 14-minute composite video showing the 41-year-old, sporting a Russian-style hat, joining in the battle as police tried to keep the two factions apart. Smith, of Sheppard Avenue, in Bowring Park, Huyton, was seen on at least four occasions hurling missiles over the heads of officers as people around her shouted obscenities, she was filmed throwing objects at protestors, and at least one also struck a Police officer. She is finally seen fighting with a woman near the BP garage and later handed herself in to police. 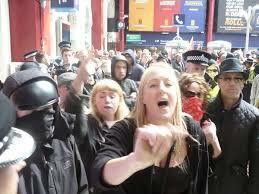 Now she has been jailed for a year after pleading guilty to violent disorder in the town. Prosecutor Andrew Espley said Smith became involved in what had started as an anti-immigration demonstration and she was part of a counter demonstration. DC Tom Banks told Canterbury Crown Court police had 500 hours of footage from the clashes on January 30. He said Smith was seen to throw objects on four occasions before she ended up fighting with another woman. A senior probation officer, Linda Jaycock, who interviewed Smith prior to sentence, said she had come to Dover as part of an anti-racist demonstration and claimed she came under attack from the rival group. Jailing her, the judge said she had read testimonies of Smith’s responsible work, which contrasted with her acting highly irresponsible when the violence began. “The responsible decision would have been to leave the area at once,” said the judge. The Chilcott report was an investigation into the British Government's decision to use military force on Saddam Hussein. • Was it right and necessary to invade Iraq in March 2003? • Could the UK, and should the UK, have been better prepared for what followed? 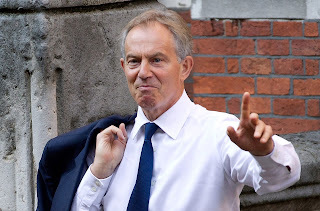 • That the UK chose to join the invasion of Iraq before the peaceful options for disarmament had been exhausted. Military action at that time was not a last resort. • The judgements about the severity of the threat posed by Iraq’s weapons of mass destruction – WMD – were presented with a certainty that was not justified. • Despite explicit warnings, the consequences of the invasion were underestimated. The planning and preparations for Iraq after Saddam Hussein were wholly inadequate. • The Government failed to achieve its stated objectives. A man using his mobile phone to film at a Birmingham v Aston Villa football match was hit with a baton by a Police Officer in a completely unprovoked attack. 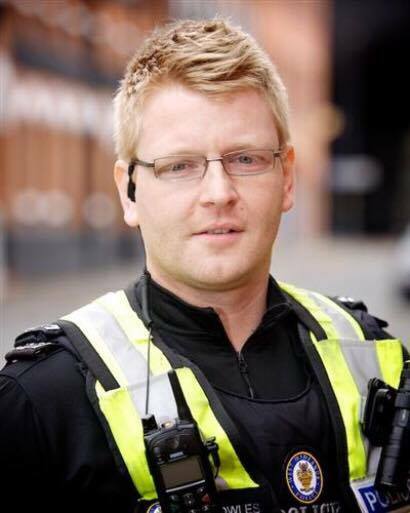 PC Paul Knowles struck the man hard with his baton, knocking the phone out of the victim's hands. (b) behaved in a manner which would justify the bringing of disciplinary proceedings. The victim attended Burton’s Hospital NHS Foundation Trust on 23 September where he had an x-ray of his left hand. The medical notes stated he had "sustained the following injuries; a comminuted displaced impacted fracture to the neck of the 3 metacarpal with some palmer angulation noted, with a superficial skin flap abrasion and a small area of bruising to the side." However, the IPCC concluded that, "having analysed all the evidence, there is no indication that PC Paul Knowles may have committed a criminal offence"
Judge for yourself, here's the video. 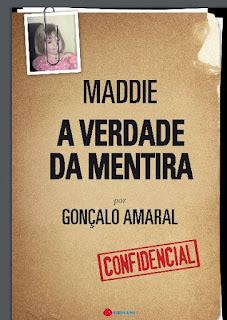 If anyone would like a PDF copy of Goncalo Amaral's book, click on the link below for a copy. 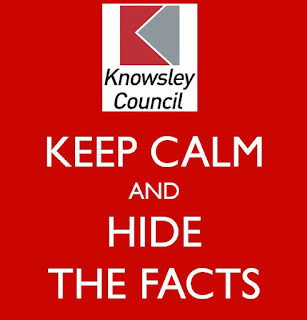 I have made a number of FOI requests to Knowsley Council over the last few years. But recently, this Council seem to be making up their own reasons for refusal, charging exorbitant amounts of money to supply simple information and simply contradicting themselves to suit whatever their agenda is. My FOI request for information about the local plan. Knowsley Council said it would take 20 hours work, at a rate of £34 per hour, a total of £680. Nice work if you can get it. An FOI request for information about 'Knowsley Youth Mutual', the company that delivers youth services on behalf of Knowsley Council, and which is 85% funded by Knowsley Council, and is made up of 'previous employees' of Knowsley Council. "Knowsley Youth Mutual is a public benefit company jointly run and owned by the former staff and youth so is not a public authority and therefore its activities are not subject to the statutory provisions set out under the Freedom of Information Act. I am not aware of any provision that as they receive funding from the Council, this places the Council “under a legal obligation to supply the requested information” so can you please point me to this obligation so that I can consider this matter further. You may wish to direct your request to Knowsley Youth Mutual, although as they are not a public benefit company they are under no legal obligation to provide this detail. If you would like me to forward your request to KYM for their consideration please advise." So, KYM are a public benefit company when delivering services on behalf of the Council, BUT, they are NOT a public benefit company if you want information about them. The Council got rid of CCTV that covered the shopping areas in Huyton village, but they still have CCTV cameras on and inside their own buildings. So, I asked, "what are the current annual costs of the 'existing resources' that are used in monitoring all of the Council's CCTV cameras? "Having considered what information we hold in relation to your request I am advising that some/or all of your request may be subject to an exemption. We are allowed additional time in which to consider these exemptions and you will receive a further response once a decision has been made. You will receive a response by 22 June 2016." 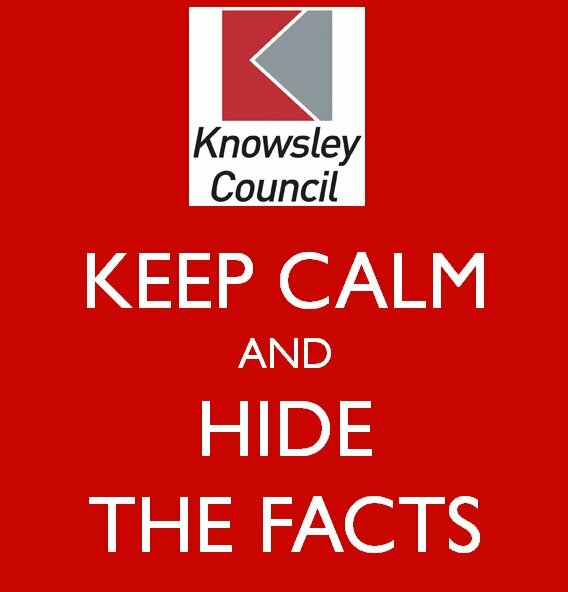 So, there you go, if you want to know about how your money was spent on the Local Plan, Youth services or CCTV cameras, well, erm, you can't, because Knowsley Council say so. 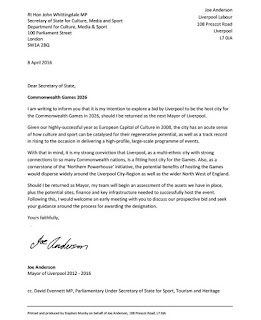 Liverpool's Mayor, Joe Anderson has made a "second major announcement this week, coming just days after he announced plans to build 10,000 new ‘rent to buy’ homes across Liverpool to help young families get on the housing ladder." 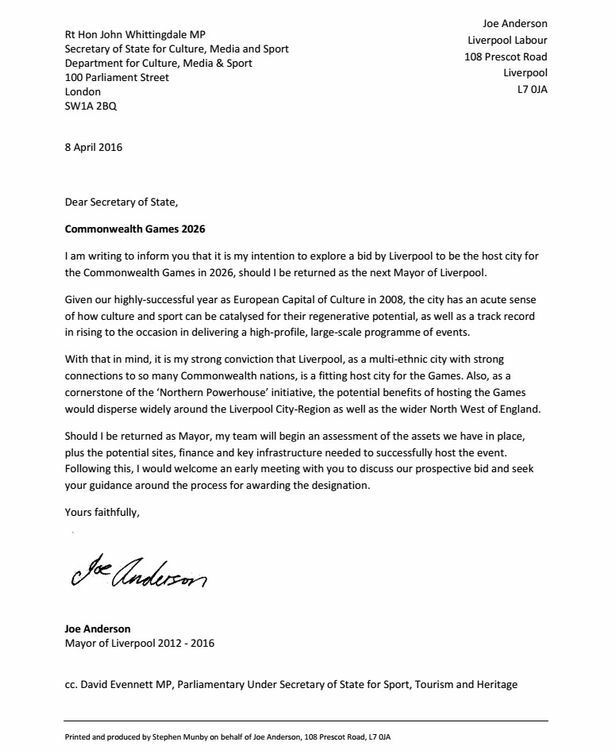 Mayor Joe Anderson has published a letter that he has sent to the Secretary of State, in which he says, "should I be returned as Mayor", "it is my intention to explore a bid by Liverpool to be the host city for the Commonwealth games in 2026"
The pre-election restrictions are governed by Section 2 of the Local Government Act 1986,as amended in 1988. 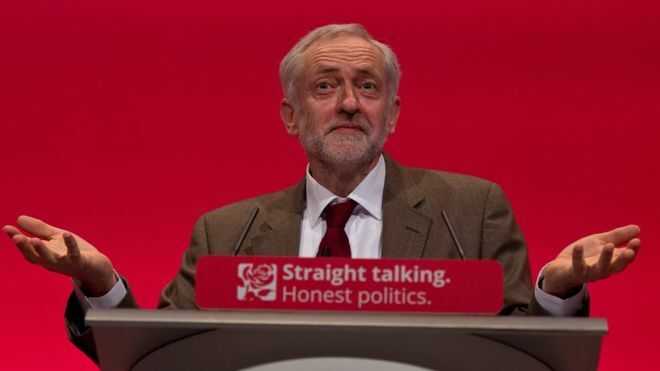 "It would be inappropriate for the post holder of Mayor to speak on controversial issues or those associated with a particular political party and care should be taken about using photos from such events if any members are standing for election." "Do not publish any publicity on controversial issues or report views on proposals in a way which identifies them with individual councillors or groups of councillors." "Publicity relating to individuals involved directly in the election should not be published unless expressly authorised by statute"